This little gem of a museum houses a theater and exhibits that tell the story of the Schuylkill River and its human connections throughout history. 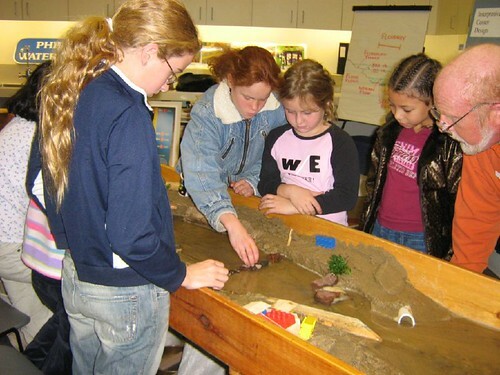 With a strong emphasis on environmental awareness, the museum invites the children to re-route historic streams, peak inside a 48 inch water main and explore the original 1812 pumping station. They’ll especially enjoy seeing where the water goes when they flush a toilet. A visit to Pollutionopolis will inspire everybody to keep it clean. The adjacent — albeit pricey — restaurant offers patio seating with a river view. Ask about kid friendly menu items. This interactive experience brings history to visitors in a fresh and engaging way, using storytelling and costumed interpretive guides. The children ages 10 and younger will love becoming junior detectives on the “Colonial Kids’ Quest,” a kid-friendly, stroller-friendly “Whodunit” in search of a missing copy of the Declaration of Independence. 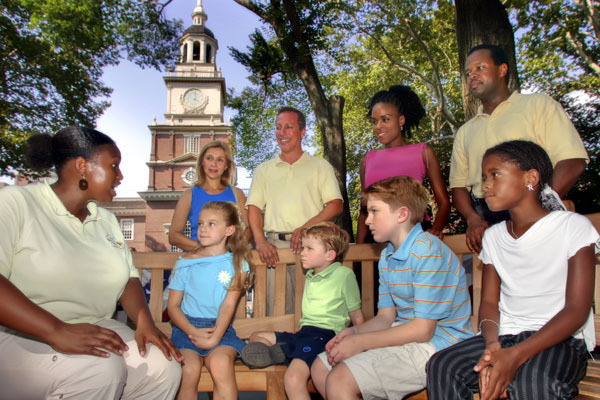 During summer, storytellers visit 13 different locations and reveal little-known secrets about Philadelphia’s history in the Storytelling Benches program. Locations and times on the website. Folk artist Isaiah Zagar, who owns the Eyes Gallery up the street, has transformed a once trash-strewn empty lot into a magical warren of walls and passageways, a stuccoed sculpture studded with shards of mirror, pottery, ceramic tiles, bicycle wheels, and colored bottles. Zagar is inspired by many artists, but especially by the whimsy and genius of Spain’s Antoni Gaudi. This is folk art at its best. Exploring the garden will be as much fun for you as for the children. Philadelphia’s newest attraction is also one of its oldest. Franklin Square, one of the five public squares that William Penn laid out in his original plan for the city, opened in the summer of 2006. The children will love this family-friendly park, which includes two playgrounds (one for children ages 2 to 5, another for ages 5 to 12), an 18-hole Philly-themed miniature golf course, a classic 30 figure carousel, storytelling benches where you can hear tales of Franklin Square’s past (courtesy of the friendly storytellers of Once Upon a Nation), and a picnic area. Four brick walking paths with nighttime lighting lead to the centerpiece of the Square, the Franklin Square Fountain, a marble masterpiece built in 1838 surrounded by wrought iron fences. The Mummer’s Parade — Philly’s answer to Mardi Gras — takes place on New Year’s Day every year (subject to weather). As parades go, this is a biggie, with 12,000 marchers, enough sequins and feathers to outfit a gaggle of Vegas show girls and strutting string bands. The children will love the spectacle; just dress for the chilly weather. An indoor rehearsal show called Mummer’s Fest takes place at the PA Convention Center December 28, 29, 20, and 31. Donation suggested.